What could be better a lovely craft project to kick start the Easter Holidays? With Easter approaching, my daughters have been coming home from school and pre school with an assortment of Easter themed crafts. With my little boy now joining the craft tables at the playgroups we attend; our fridge door and Art folders are getting increasingly full! A lovely way to display some of the smaller decorations is to make an Easter Tree. This can be kept inside or outside depending on the size you make it and your choice of materials. We are very lucky to have our garden back out into woodland, so we have an unlimited supply of pine cones, sticks and twigs on our doorstep. What more could we want for this project? Accompanied by the cat and our trusty forage bag, we gathered up two varieties of fallen pinecones, some fallen fir stems and the perfect sticks to make our tree. In addition to natural materials, you will need some poster paint, card, hole punch, paint brushes, thread to hang decorations with and plastic tubs to contain the paint for dipping. Of course, you also need a container to stand your tree in. We chose a plant pot with soil in, but a large vase works perfectly too. You can of course use whatever colours you like. We chose pink, yellow, white and purple to make our tree stand out. Standing in a brightly coloured pot, it looked quite striking once complete. To begin with, paint your sticks in the bright coloured paints you have chosen. I HIGHLY recommend you do this outside! These will take a couple of hours to fully dry. We took the drying time as the perfect opportunity to make our decorations. Dipping pinecones into the paint, rolling fir stems in it to create baubles and decorating card eggs; a lot of fun was had! Tying thread around each decoration tightly gave us a nice hanging loop to attach to our tree. Once dry, place the sticks into your container and fan out to create a tree. Then get busy decorating! The children took this task very seriously, ensuring they were evenly spaced. I think my Christmas tree fussiness sunk in deeper than I thought! The idea behind the Easter tree for us, is to share new life. The eggs were all decorated with happy pictures of chicks, lambs, stars and the words ‘Happy Easter’. The twigs and pinecones represent growth and a change in the season. The bright colours are to bring a smile to the faces of all that see it. It’s a lovely way to spend a warm spring day outside. It didn’t cost a penny and is stood proudly outside for us to admire. My children really enjoyed this project from start to finish, they were all able to participate to different levels. It really is an activity for all ages. 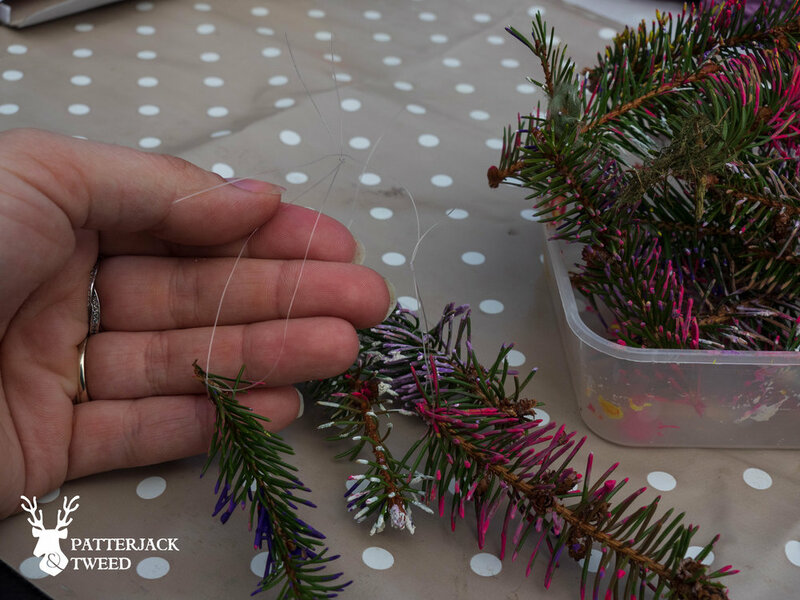 Why don’t you have a go at making your own Easter tree this Holiday?